Maintaining mechanical integrity in this region is critical for optimal outcomes in dialysis access. Hemodialysis prosthetic grafts provide a relatively stable conduit for hemodialysis; however, they are prone to dysfunction and eventual failure primarily due to intimal hyperplasia at the venous anastomosis leading to venous stenosis, disruption in flow, and eventual thrombosis. Primary intervention-free patency from creation of prosthetic arteriovenous grafts (AVGs) at 1 year is 40%.1 Mainstay therapy in the past has been plain old balloon angioplasty (POBA). With repeated POBA interventions, cumulative patency rises modestly to 50% for AVGs; however, patency is limited, and multiple reinterventions are required to maintain functionality of the access over time. The Kidney Disease Outcomes Quality Initiative indicates that a 50% primary patency at 6 months is expected following POBA; this consensus statement was based on retrospective data.2 Despite this, four randomized prospective studies indicate that primary patency of POBA, at least within prosthetic grafts at the venous anastomosis, is actually much poorer. In studies by Vesely and Haskal et al, 6-month primary patency ranged from 23% to 40%.3-6 Given the relatively poor patency of POBA and the associated attendant costs, multiple devices have been investigated to improve patency and capitalize on the opportunity of improving patency of dialysis accesses, which cost the global economy billions of dollars annually. WHY STENT GRAFTS OVER POBA? Although there are multiple peripheral stent grafts available on the market, some of which have been studied in multicenter randomized prospective studies within dialysis grafts, the GORE® VIABAHN® Endoprosthesis device was the only device studied across the elbow and in patients who present with thrombosed AVGs.6 Loop AVGs within the forearm are more common than other locations of dialysis grafts; they frequently traverse the elbow joint and patients often present with thrombosed grafts for intervention. The REVISE trial using the GORE VIABAHN Endoprosthesis reflected this real-life clinical practice.6 The GORE VIABAHN Endoprosthesis is composed of reinforced ePTFE attached to an external nitinol stent structure and a heparin-bonded surface. The single helically wound nitinol wire has no longitudinal connections, contributing to the flexibility and mechanical integrity for which the device has become known. Importantly, this external nitinol support does not extend beyond the ePTFE. A 75-year-old man had undergone six prior POBA interventions within 1 year and presented for a declotting procedure of his right forearm loop graft. The only lesion identified within the access circuit was a venous anastomotic stenosis, where the AVG was anastomosed to the basilic vein at the elbow joint. The graft was sized to 6 mm at the venous anastomosis. The stenosis was 3 to 4 cm in length (Figure 1A). Given the multiple previously failed POBA events within a year and the patient’s presented thrombosed access, we elected to place a stent graft. The GORE VIABAHN Endoprosthesis was selected based on proven patency efficacy across the elbow joint. We avoided using the BARD® FLAIR Endovascular Stent Graft or BARD® FLUENCY® PLUS Endovascular Stent Graft given their relative rigidity and no patency evidence for placement across a joint space. The diameter of the GORE VIABAHN Endoprosthesis should be at least 5% to 20% larger than the diameter of the graft and there should be at least 1 cm of coverage before and after the stenotic vein segment for secure placement. Given the case criteria, an 8 mm diameter x 100 mm length device was chosen and deployed (Figure 1B). No repeat interventions were required within a year following placement of the stent graft. Figure 1. Venous anastomotic stenosis extending across elbow joint (A). An 8 x 100 mm GORE® VIABAHN® Endoprosthesis was deployed and following postdilation, there was a satisfactory angiographic result (B). 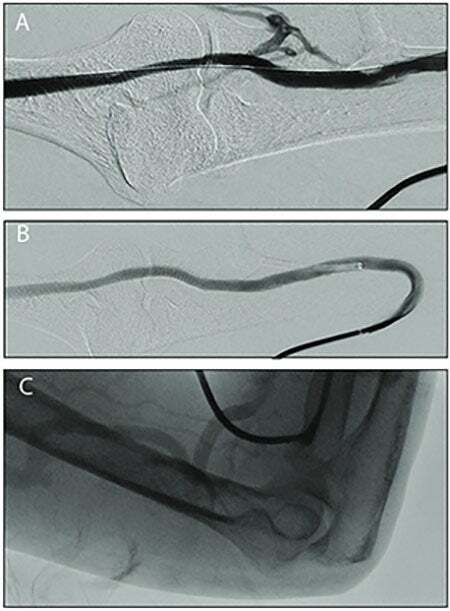 A 67-year-old man had a 2-year-old 6 mm loop graft within the left arm that had clotted twice within the previous 2 months and had two prior POBA interventions for venous anastomotic stenosis over a 4-month period prior to that. He now presented with a clotted graft for the third time. The only offending lesion was found at the venous anastomosis to the basilic vein, which had undergone angioplasty four times with an 8 mm balloon (Figure 2A). After declotting of the graft with POBA resulted in a poor angiographic result, an 8 mm x 50 mm GORE VIABAHN Endoprosthesis was placed across the stenosis, which was selected (based upon the measured size of the post-POBA size of the distal landing location) and placed across the elbow joint (Figure 2B). Three months later, the AVG continued to function with no additional interventions (Figure 2C). Figure 2. Venous stenosis at the end of the AVG across the elbow joint after suboptimal POBA. Note the venous collateral overlying the radial head, indicating resistance to antegrade flow (A). Device with flow through it with the arm straight (B). Flow across the GORE® VIABAHN® Endoprosthesis with the elbow flexed and the device bent more than 90˚ with no inhibition of flow (C). The GORE VIABAHN Endoprosthesis is highly flexible and kink resistant. The release/deployment mechanism of the device allows for more accurate placement and less of the “forward jumping” that is seen with other deployment mechanisms. Specifically, the release mechanism is a pull chord that releases the device from the delivery shaft. Other devices employ a pin-and-pull mechanism that results in a more variable position of deployment, often with forward jumping of the stent graft. In terms of sizing the device and diameter selection, the GORE VIABAHN Endoprosthesis is sized to the venous outflow end of the graft to ensure sufficient wall apposition for anchoring and reducing the risk of migration. Recommended oversizing is 5% to 20%. Wall apposition to the vein at the outflow of the GORE VIABAHN Endoprosthesis is not required, and the device can be smaller in diameter than the outflow vein. The REVISE study was a randomized prospective study that compared treatment of venous anastomotic stenosis of AVGs with POBA versus placement of the GORE VIABAHN Endoprosthesis. As previously mentioned, the study allowed inclusion of patients with stenosis across the elbow joint and patients presenting with thrombosed accesses. Overall, the 6-month target lesion primary patency was significantly better with the GORE VIABAHN Endoprothesis at 52% versus 34% for POBA.6 There were also multiple other notable results within this study. First, 44% of patients presented with thrombosed accesses and 17% (n = 22) had devices placed across the elbow. Second, despite patients presenting with thrombosed accesses, the GORE VIABAHN Endoprosthesis had superior target lesion patency over POBA (36% vs 24%), and third, no devices placed across the elbow fractured up to 24 months with improved patency at 6 months (72% vs 49%). In summary, I prefer the GORE VIABAHN Endoprosthesis for interventions within AVGs due to its flexibility, kink resistance, ability to use across the elbow, and proven efficacy in the treatment of thrombosed AVGs. In addition, visibility and ease of deployment with minimal if no deployment migration are added advantages of this device compared to other available stent grafts in dysfunctional dialysis accesses. Huber TS, Carter JW, Carter RL, Seeger JM. Patency of autogenous and polytetrafluoroethylene upper extremity arteriovenous hemodialysis accesses: a systematic review. J Vasc Surg. 2003;38:1005-1011. Vascular Access 2006 Work Group. Clinical practice guidelines for vascular access. Am J Kidney Dis. 2006;48:S176-S247. Haskal ZJ, Trerotola S, Dolmatch B, et al. Stent graft versus balloon angioplasty for failing dialysis-access grafts. N Engl J Med. 2010;362:494-503. Vesely TM. Use of stent grafts to repair hemodialysis graft-related pseudoaneurysms. J Vasc Interv Radiol. 2005;16:1301-1307. Haskal ZJ, Saad TF, Hoggard JG, et al. Prospective, randomized, concurrently-controlled study of a stent graft versus balloon angioplasty for treatment of arteriovenous access graft stenosis: 2-year results of the RENOVA study. J Vasc Interv Radiol. 2016;27:1105-1114.e3. Vesely T, DaVanzo W, Behrend T, et al. Balloon angioplasty versus Viabahn stent graft for treatment of failing or thrombosed prosthetic hemodialysis grafts. J Vasc Surg. 2016;64:1400-1410.e1. Sick PB, Brosteanu O, Niebauer J, et al. Neointima formation after stent implantation in an experimental model of restenosis: polytetrafluoroethylene-covered versus uncovered stainless steel stents. Heart Dis. 2002;4:18-25. Roy-Chaudhury P, Sukhatme VP, Cheung AK. Hemodialysis vascular access dysfunction: a cellular and molecular viewpoint. J Am Soc Nephrol. 2006;17:1112-1127. Proven across a broad range of complex cases, the versatility of the GORE® VIABAHN® Endoprosthesis with Heparin Bioactive Surface* enables you to deliver high patency and durable outcomes to minimize interventions for your patients. Cannulate within 24 hours to allow for earlier removal or avoidance of a CVC. Disclosures: Consultant for Becton Dickinson and Gore & Associates.